Dark Chocolate Orange Scones - in just 22 minutes! Dark Chocolate Orange Scones bring the classic Italian flavor combination of orange and dark chocolate together with scones, a classic British pastry. 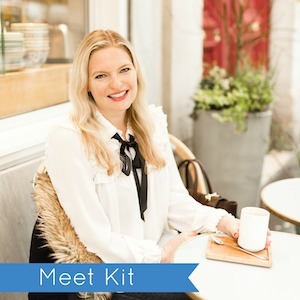 Oh, and the total preparation time is just 10 minutes of active preparation and 12 minutes of baking! 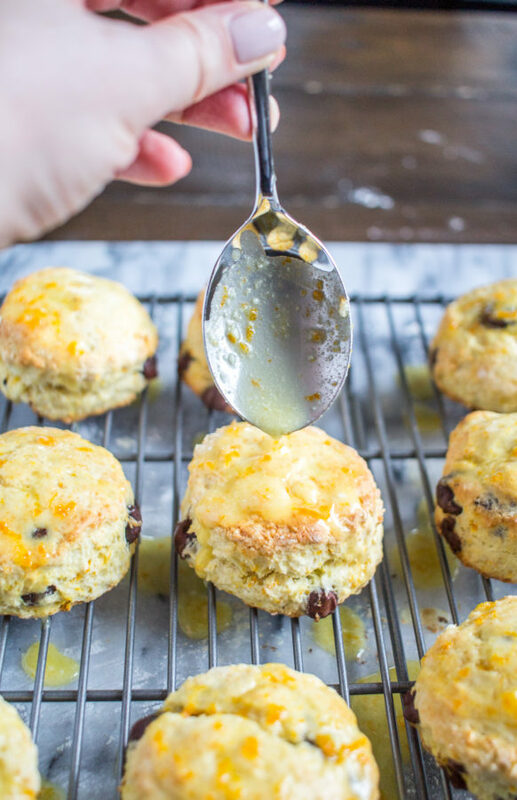 Dark Chocolate Orange Scones are flavored with orange zest and fresh orange juice for a bright fresh orange flavor. The burst of dark chocolate gives the scones a taste that might remind you of the dark chocolate oranges that are popular at Christmastime. 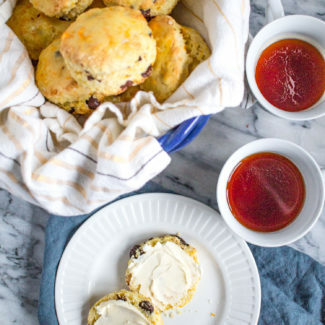 The best way to serve scones is with clotted cream. If you go to a grocery store you can find it in the refrigerated section, probably by the cheese or cream. 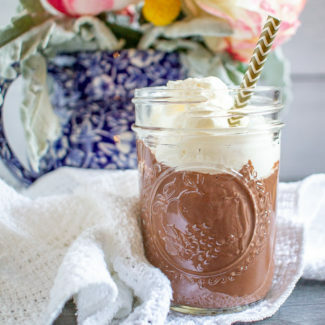 It you haven’t tried it, it has a rich thick creamy consistency and a mild taste. It’s reminiscent of mascarpone, but not as tart. 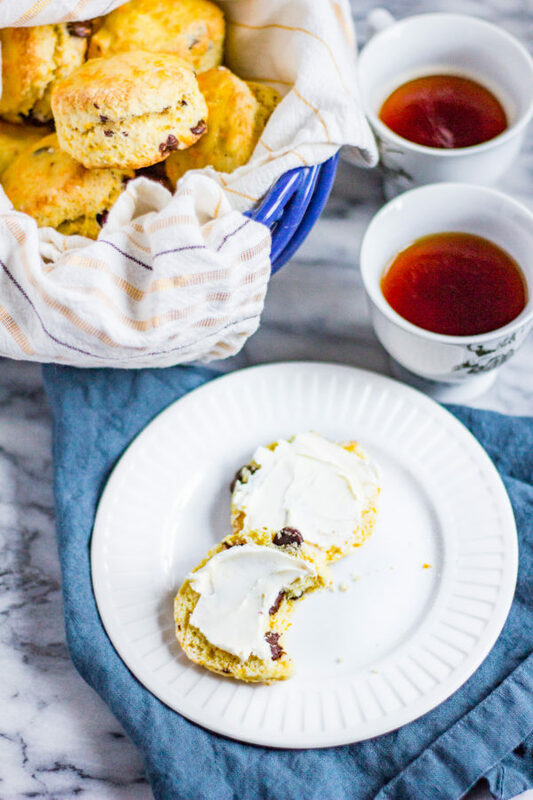 But, since these scones have dark chocolate chips and lots of orange flavor, the clotted cream isn’t absolutely necessary. I used a 2-inch round biscuit cutter to cut out the scones. If you don’t have a biscuit cutter, you can use a knife to cut the scones into triangles. The baking time will vary based on the size and thickness of the scones. 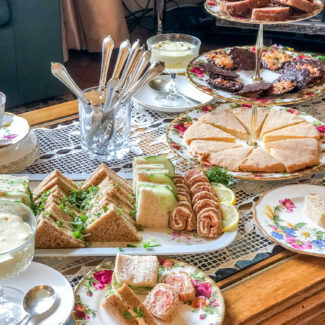 I recommend checking on the scones after they have baked for 8 minutes, and cooking them until they are golden brown, being sure to keep a close eye on them. 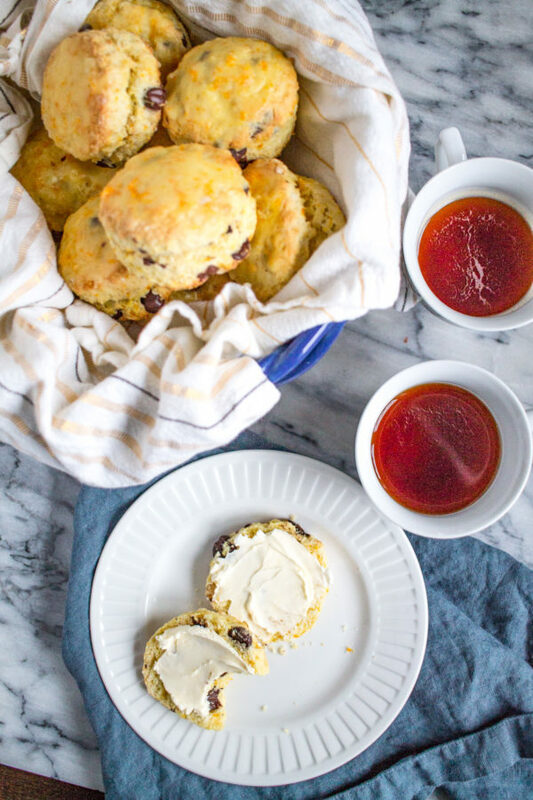 There are two secrets to getting your scones to rise. First you need your oven to be hot, let it reach 425 before you place the scones in the oven. Secondly, when you brush the egg and milk mixture on top of the scones, only brush it on the top of the scone. 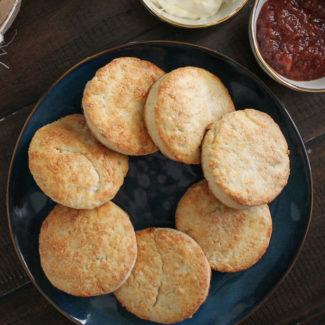 Don’t let it run down the sides of the scones. This will result in lopsided scones. Sidenote: It’s Charles’s birthday today! Happy birthday to Charles! 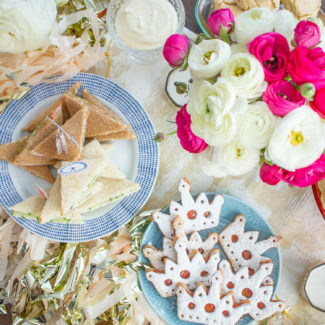 It seems so fitting to be sharing a British inspired recipe on his birthday. 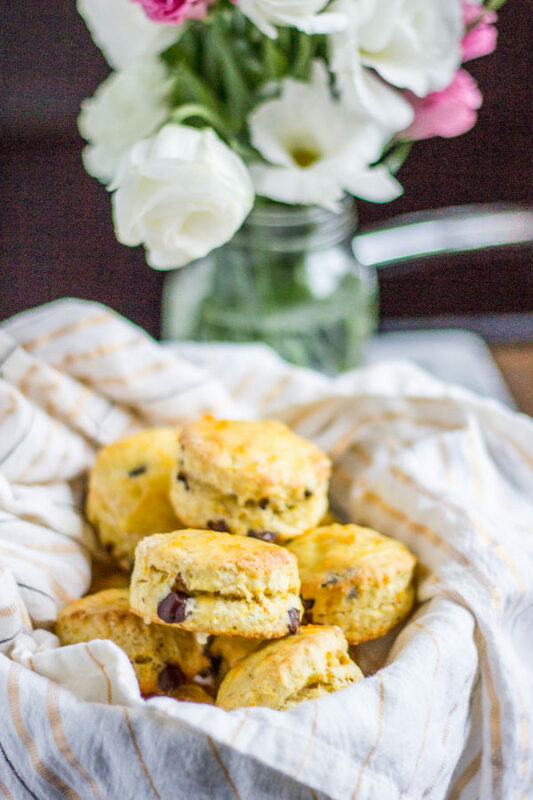 Dark Chocolate Orange Scones bring the classic Italian flavor combination of orange and dark chocolate together with scones, a classic British pastry. 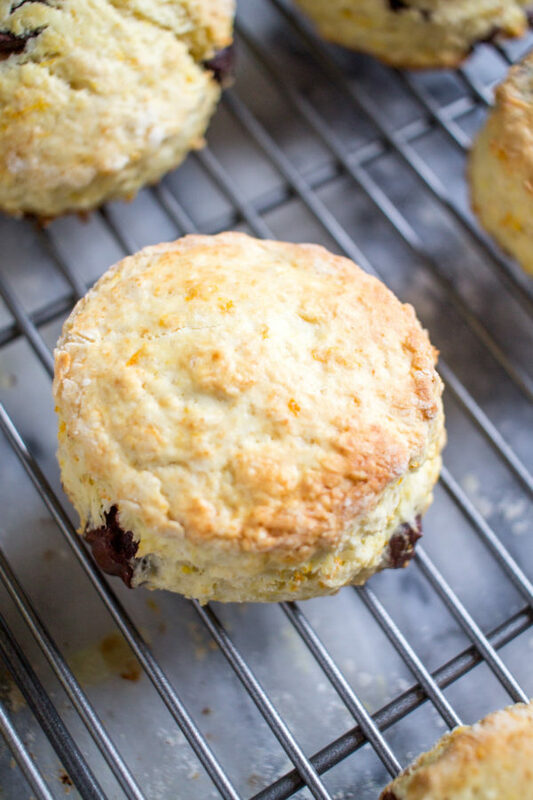 Dark Chocolate Orange Scones are flavored with orange zest and fresh orange juice for a bright fresh orange flavor. The burst of dark chocolate gives the scones a taste that might remind you of the dark chocolate oranges that are popular at Christmastime. Zest the orange using a microplane. You will need 2 tablespoons of zest. 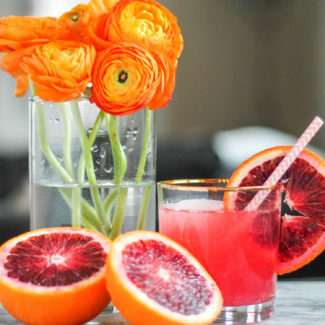 Then slice the orange in half and squeeze out 3 ½ tablespoons of juice. Set aside. In a mixing bowl, whisk the flour, baking powder, and salt together. I recommend using a whisk because it will remove any clumps. Crack the egg into a one cup liquid measuring cup. Add 2 tablespoon of the orange juice, and whisk to combine. Then add enough milk so that the mixture measure 200 ml (7 ounces). Whisk to combine. Next, take a cheese grater, and use the grater to grate the butter into the flour mixture. Then use your fingers to mix the butter into the flour, until it resembles fine breadcrumbs. Stir in the granulated sugar, 2 tablespoons of the orange zest, and the dark chocolate chips. Use a fork and stir about ¾ of the milk mixture into the flour mixture. You want the dough to be soft and just slightly sticky. You will have some of the milk mixture leftover, and you will need it later. Place the dough on a floured surface and knead gently until the dough is evenly mixed. Use your hands to flatten the dough until it is ¾ of an inch thick. 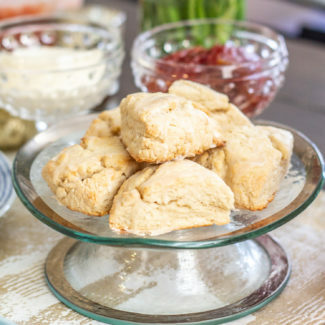 Use a biscuit cutter to form the scones, or use a knife to slice them into triangles. Arrange the scones on a parchment lined baking sheet, leaving 2 fingers space between each scone. Carefully brush the tops of the scones with the remaining milk mixture, making sure that none of the milk mixture runs down the sides of the scones. Bake the scones for 9-12 minutes, until golden brown. Mix up the orange glaze by combining the powdered sugar, remaining orange zest, and remaining orange juice. Let the scones cool for a few minutes, then brush them with the orange glaze. I used a 2-inch round biscuit cutter to cut out the scones. If you don’t have a biscuit cutter, you can use a knife to cut the scones into triangles. The baking time will vary based on the size and thickness of the scones. I recommend checking on the scones after they have baked for 8 minutes, and cooking them until they are golden brown, being sure to keep a close eye on them. 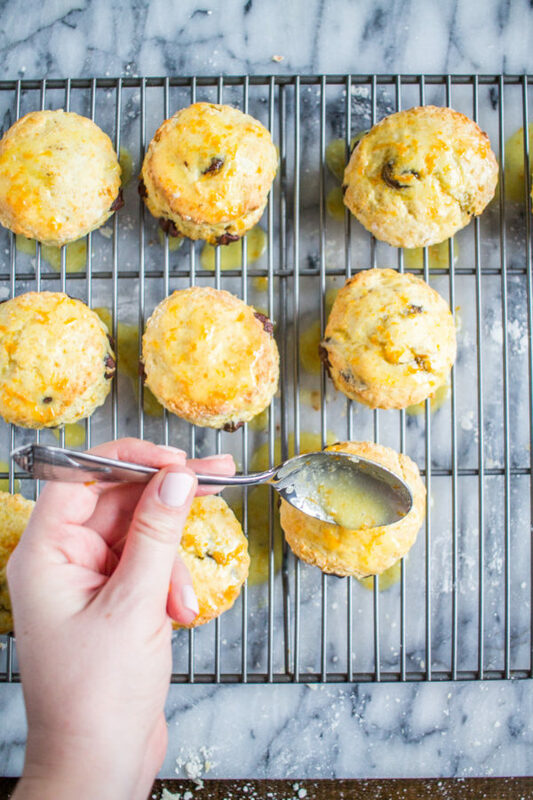 There are two secrets to getting your scones to rise. First you need your oven to be hot, let it reach 425 before you place the scones in the oven. Secondly, when you brush the egg and milk mixture on top of the scones, only brush it on the top of the scone. Don’t let it run down the sides of the scones. This will result in lopsided scones.